Travel to Morocco desert, to discover Erg Chebbi dunes, the historical Ait Ben Haddou Kasbah, Toudra and Dades Gorges, Ziz valley and unique camel trekking experience in Merzouga dunes. Certainly, our company puts your safety and enjoyment first. Our English speaking staff can deliver a perfect customer service experience to our valued clientele. Either for family, groups or private travelers. We guarantee excellent value for money on all our tours and are only too pleased to cater for the individual needs of each of our guests. Our approach is intimate. So, we work closely with you. Learning about your style, interests, and temperament, to craft a perfectly tailored experience. 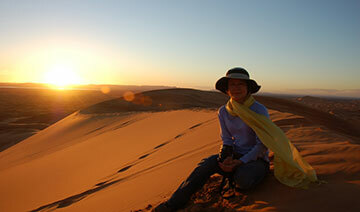 Even more, we design our Morocco desert tours with the total experience, and the total person, in mind. That’s why you’ll see us offer events and experiences that are totally unique. We’re creating them ourselves and our staff gives us unmatched capabilities in this regard. We can’t make the sunshine or the rainfall, but we can promise to do everything in our power to ensure an unforgettable and exceptional Morocco Sahara desert trips. I hope you’ll join us. Put an end to all your trips becoming the same! Stop and try living the dream. Marrakech Day Excursion will be the trip that everyone talks about so much. Come and experience the adventure, excitement and your own love story. 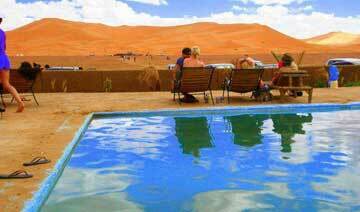 Discover the harmonious blend of modernity, the authenticity and the desert in all year round sun. Marrakech, a very different venue, one that has all of the ingredients to make up a total incentive destination. Breathtaking scenery flanked on one side by the majestic Atlas mountains and on the other side by the desert and the Atlantic coast. A wide choice of hotels to suit conference and incentive buyers requirements. Superb conference facilities are available in the Palais Des Congrès. The old walled city with its souks and Jemaa El Fna square offers a fascinating glimpse into the local lifestyle. Delicious Moroccan and European cuisine, excellent facilities; Golf courses as well, a variety of evening entertainment with international night-clubs and discos, as well as the spectacular “Fantasia”. There are extensive sightseeing opportunities to make your day trip a success. 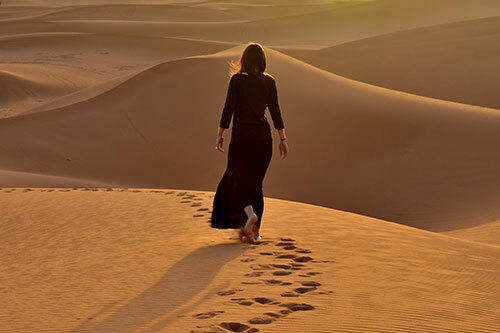 At Morocco-deserttours.com, we take pride to offer the best Morocco desert tours; we can quickly arrange private tours to our respected customers on short notices. We guarantee enhanced satisfaction and experience of a lifetime through our services. All you got to do is to book us for the selected tour, specify your particular requirements, and we will take care of the rest. After the competition of booking procedure, we will send a confirmation email to you along with your trip voucher. 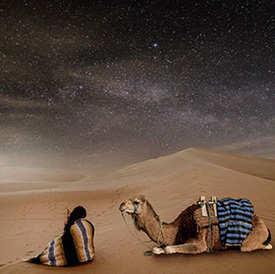 The Moroccan desert tours offered by us also include a unique experience of Morocco desert camel trek. You can ride the ‘ship of the desert’ and explore the nearby areas. 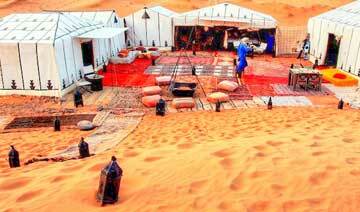 Moreover, a sleep-over at Morocco Sahara Desert camp is also included. 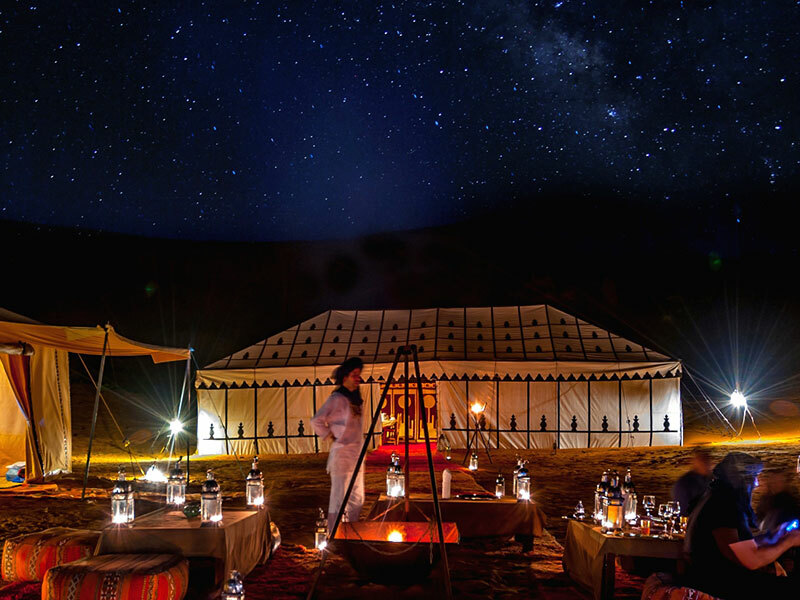 This experience of sleeping in the middle of the desert in a cool and calm environment is surely going to be one of the most memorable times for you. You will also be able to view and capture the fascinating sunset and sunrise moments, which form the highlight of a Morocco desert tour. 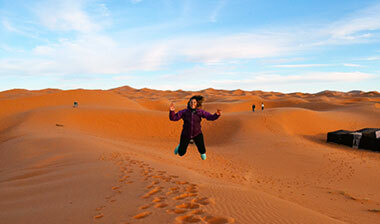 Morocco-deserttours.com is a name to rely on if you are seeking maximum pleasure on your Morocco Sahara Tours. We are a licensed tour operator having years of experience and expertise in arranging and organizing the best Morocco desert tours. 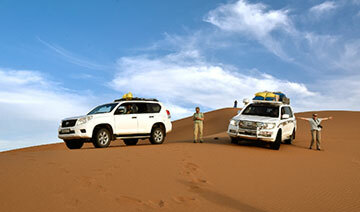 We can also arrange custom Morocco desert group tours as per the requirements of our customers. 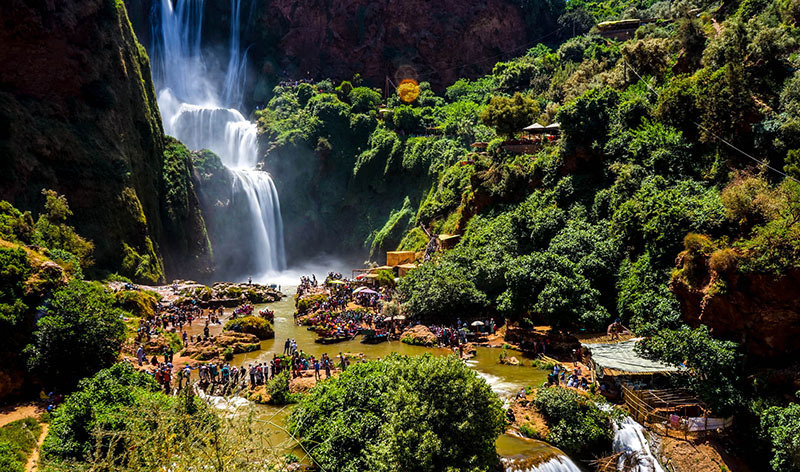 For the adventure lovers out there, we have a designed a special tour for them that will take them to explore the natural beauty of Marrakech and Fes in a single trip. 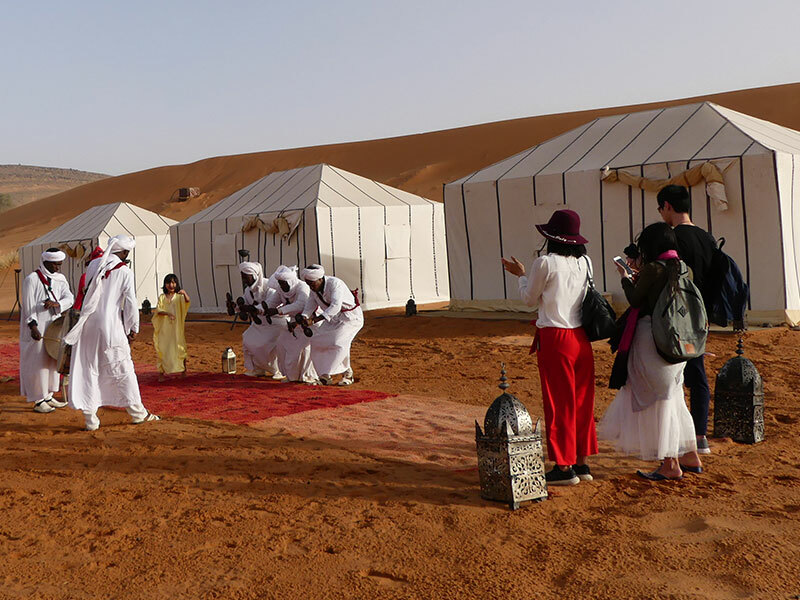 The amazing sights of the Erg Chebbi Dunes and experience of Sahara Desert camp overnight stay there is surely going to remain etched in their memories for a long time. 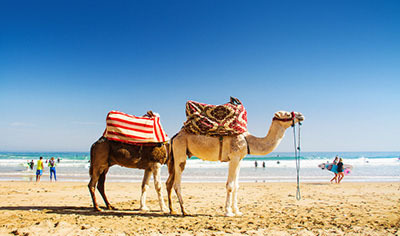 Our years of experience in arranging and handling successful Morocco desert excursions have made us one of the most preferred names in the country. The factors that set us apart from rest of the Morocco tour operators include our dedication and commitment to giving the best experience to our clients and the rates at which we offer our services. Unlike other tour operators, we do not charge a bomb. We offer amazing services at market-competitive rates. 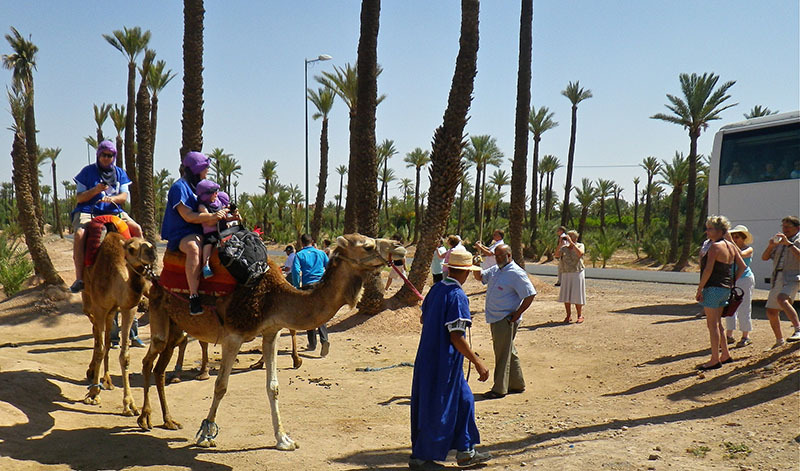 If you are short on time or have budget constraints, you can still enjoy your Marrakech desert excursions to the maximum with us. We offer amazing one-day Morocco tours, which will not burn a hole in your pocket. 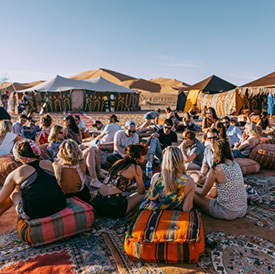 You can have a day trip from Marrakech to Sahara desert that will take you to visit and explore numerous attractions of the city including historical spots as well. 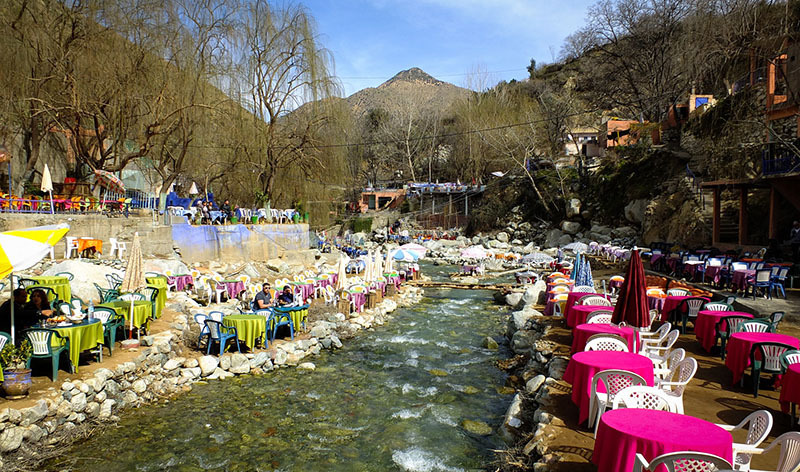 Furthermore, we also offer one-day tours to Atlas Mountains, Ourika Valley, Ouzoud Waterfalls, Ouarzazate and Kasbah Ait Ben Haddu and Essaouira. You will be taken on an air-conditioned minibus along with other tourists to the destination you have selected. An English speaking guide will also be there for your service throughout the journey. 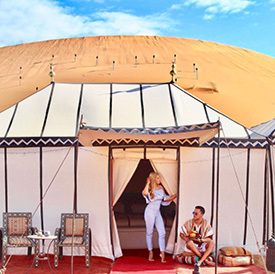 Irrespective of the fact that you have booked shared Morocco desert tours from Marrakech or a private Morocco desert safari adventures, we make sure you will have the best desert day trip. At Morocco-deserttours.com, we pay complete attention to every major and minor detail of the tour that we arrange. Each requirement and specification by our customers is valued and the tour is arranged accordingly to give them the best experience. Our expert guide will share interesting information related to the major attractions of the tour you will be taken to. They will leave no stones unturned to make this tour the best one of your life. You will be able to interact with the locals, spend some fun time with, listen to their wonderful stories, and explore the nearby villages during your Morocco Sahara desert trip. At Morocco-deserttours.com, your comfort is our responsibility. Therefore, we have arranged air-conditioned vehicles that will be used during the tours. 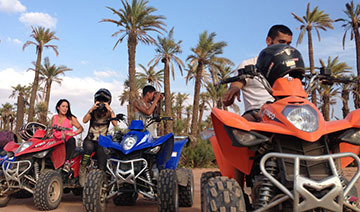 For the group Morocco desert tours, we have a specialized 4 x 4 vehicle and a mini-bus. There will be no dirt related issues or heat if you are exploring the beauty of the desert with Morocco-deserttours.com. Furthermore, we follow complete safety measures to make sure our valued customers have a safe and sound travel experience with us. 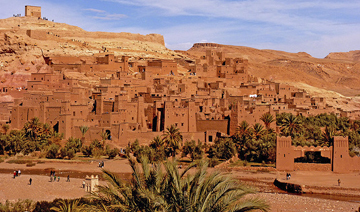 Morocco is known worldwide for the adventure and excitement filled Morocco sahara tours. At Morocco-deserttours.com, we can help you to double the fun and excitement of taking the desert tour with our premium services, which are available at the most affordable rates. Whether you want to book a private Marrakech to Fes desert tour, group or shared Marrakech to Fes desert tour via Merzouga, Marrakech to Merzouga tour or any Morocco desert tours from Marrakech, Morocco-deserttours.com is the name to reckon with. 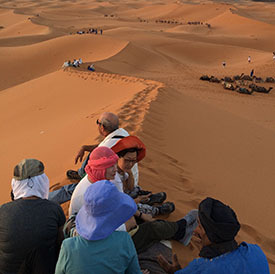 All of the private and budget group Morocco Desert Tours are designed in a way so that our valued customers have the best experience of visiting Morocco. You will be able to make lifelong memories of your tour to Morocco if you are opting for our services. We, at Morocco-deserttours.com are offering special discounts and deals on the tours we arrange. Students can avail our discounted deals and enjoy this amazing opportunity to explore the beauty of desert at the most reasonable rates.